This circuit provides secrecy when two or more telephones are connected in parallel to a telephone line. The circuit also prevents incoming calls to as well as outgoing calls from other telephones connected in parallel, except from the one lifted first. When someone picks up the handset of the telephone connected in parallel to the original (master) phone for making an outgoing call, no dial tone is heard and the phone appears to be dead. But when a call comes, the ring signal switches the SCRs ‘on’ and conversation can be carried out. As soon as the handset is kept on the hook, the SCR goes off and the telephone can again only receive incoming calls. When a call comes, conversation can be made only from the telephone which is lifted up first. To carry out conversation from the other telephone, the handset of the telephone that was lifted up first has to be placed on the hook and then the push-to-on switch of the associated circuit of the other telephone has to be pressed after lifting up its handset. Thus the circuit ensures privacy because both the telephones cannot be active at the same time. Those who are don’t need parallel telephones can rig up the associated circuit of a single telephone to work as an outgoing call preventer. 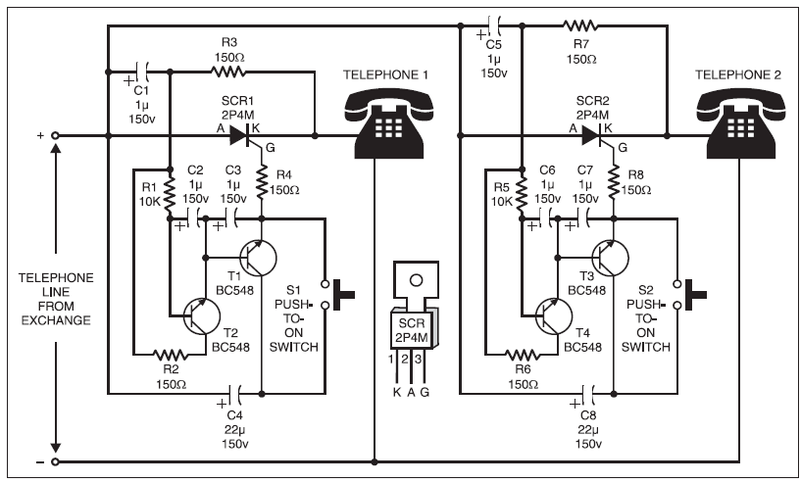 An outgoing call can be made only when one lifts up the handset and presses the push-to-on switch of its associated circuit. The polarity of the telephone line can be determined by a multimeter. To avoid confusion, a bridge rectifier can be used at the input of the circuit.